LED displays are necessary to indicate audio levels, measurements and even for ornamental purposes. The simplest way to design an LED display is the circuit around the popular bar graph IC LM 3914. Only few discrete components are required to construct of Bar graph display. 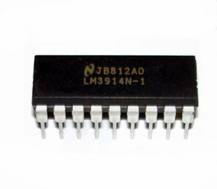 The note given here is useful to design the display driver using LM 3914 and its related versions.